Red Curry Paste is an English term that encompassed 2 types of Thai red curry paste, Prig Gang Ped (Red Curry Paste) and Prig Gang Kua (Basic Red Curry Paste). 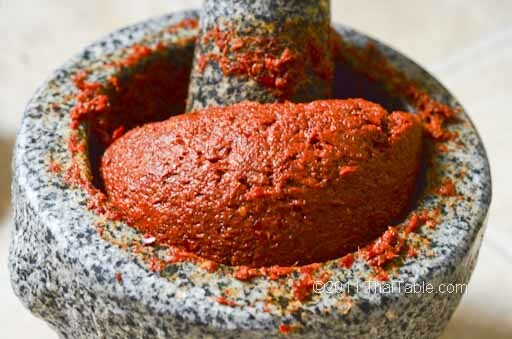 Red Curry Paste is Basic Red Curry Paste with toasted peppercorns, cumin and coriander. Red curry paste is darker in color compared to Basic Red Curry Paste because of the added dry spices. The aroma of red curry paste is a blend of lemongrass, kaffir lime zest and the dried spices. You use this curry paste to red curries that are generally creamy and salty. 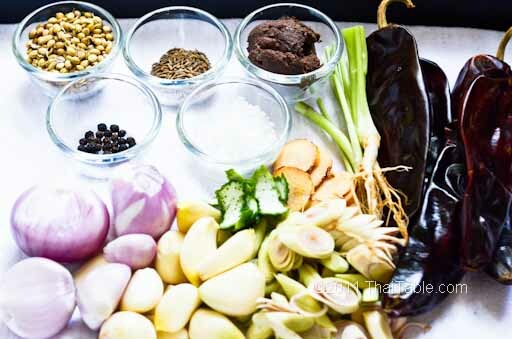 See how Red Curry Paste differs from Basic Red Curry Paste. In making red curry paste, one important, but difficult-to-find ingredient is kaffir lime zest. Please do not substitute kaffir lime leaves for the zest as you would not substitute lemon leaves for lemon zest in lemon meringue pie. Kaffir lime zest has a distinct scent and flavor and regular western limes are an ineffective substitute. Cilantro roots are often not available; substitute stems for roots. One of the benefits of making your own curry paste is that you can control the heat. Use large dried chili peppers for mild curry. Use dried Thai chili peppers if you like you curry extra hot. In Thailand, almost every mother would teach you to seed and soak the dried chili peppers in water before pounding. However, my mother loves technologies and experiments, she found this method messy and harder to grind. Instead she puts her dried chili peppers in a toaster oven for 5 minutes to get rid of the moisture. Do not toast the peppers! You want low heat. Once when the peppers are super dried, they are crunchy and easier to grind. Without the water, it's not as messy. Toast coriander, peppercorns and cumin in a pan until light brown. You’ll hear the crackling sound when they're ready. It should take a few minutes. Let the spices cool so they will grind easily. Slice shallots, lemongrass, galangal and cilantro roots into small pieces. I use one lemongrass stalk. Slice thinly or grate the kaffir lime zest. They will grind into fine paste with smaller fibers. For the dried peppers, if you love hot curries, I recommend using Thai chili peppers. For milder curries, use the dried Anaheim peppers which are larger and can be found at most Hispanic markets. Pound the ingredients into the side, almost at the deepest spot, at a 65 degree angle. Do not pound straight down into the center of the mortar; things will bounce back at you. 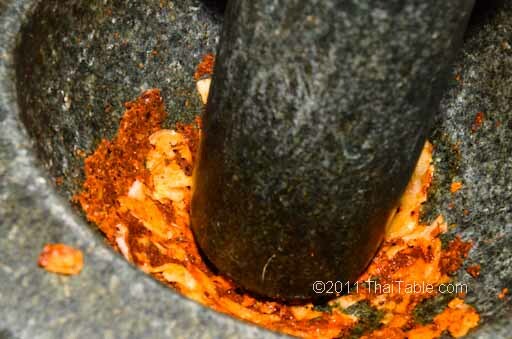 Pound and drag out the pestle to separate the fibers. Ingredients with least amount of water content and/or hard ingredients go in first. Leave the shallots for last. 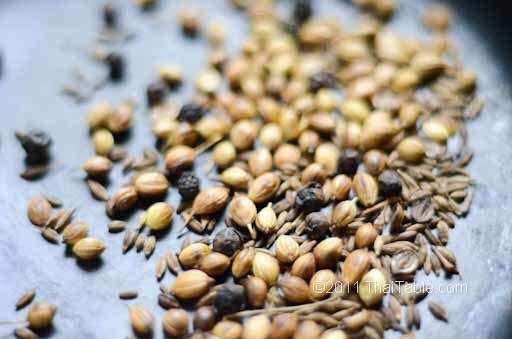 Grind the spices (cumin, coriander and peppercorns) into powder. Scoop out and set the ground spices aside. Add dried whole chili peppers and salt. Grind until the chili peppers turn into powder. Add lemongrass and galangal into the mortar. Grind them into rough fibers. Add garlic, kaffir lime zest and cilantro roots. When you can no longer recognize the individual ingredients, add shrimp paste. Mix well. It took me a good 20 minutes of straight pounding; good for your arm. You are excused from going to the gym today! 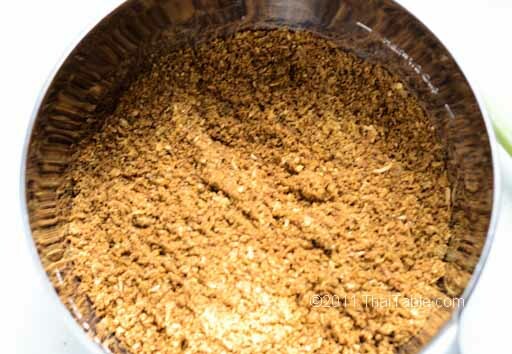 The role of salt in curry pastes is to help with grinding and to act as a preservative. You may add more salt than what’s called for; just remember when you cook with it to taste your curry prior to seasoning. You can store the curry paste in the freezer for at least one year. I put my curry paste in a freezer bag and flatten the paste to get rid of the air. Once when the flattened paste is frozen, it can be easily broken off into smaller pieces.